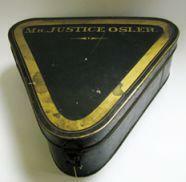 In January 2007, the Law Society received five objects from the estate of Elizabeth Henrietta Osler. 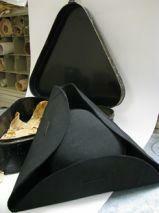 The collection consists of: a black tricorne, a tin storage box, a cap, a rosette and a leather hat box. The artefacts are interesting because of their provenance, because they are unique in our collection, and because they document legal dress in the 19th century. 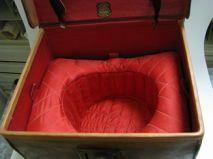 The hat box, a lovely thing to behold, also has a story to tell. Ms. Osler came from a prominent Toronto family with strong connections to the legal profession. While not much information is available on Henrietta, it appears she was the Chief Commissioner of the Girl Guides of Canada at some point and may have been a philanthropist and a collector of French Realists and Impressionist art. Her grandfather was Featherstone Osler (1838 - 1924), a Bencher of the Law Society and its Treasurer from 1921 to 1924. He was also a judge of various courts. Justice Osler was one of nine children and his siblings included brother Britton Bath Osler, a prominent criminal lawyer and founder of what is now Osler, Hoskin & Harcourt; Sir Edmund Boyd Osler, a successful businessman and politician; and Sir William Osler, an icon of Canadian medicine. Ms. Osler's father was (Featherstone) Britton Osler (1874 - 1943), a partner at Osler, Hoskin & Harcourt and a Bencher of the Law Society from 1930 to 1931. Her mother, Marion Pickton Gwyn, was the daughter of lawyer Herbert Charles Gwyn, and at least one of her brothers, Britton Michael Osler, was also a member of the legal profession. Four of the items in the donation likely belonged to Henrietta's grandfather. The first two objects are a black tricorne and the tin box to store it. Except for its shape, the box is of similar design as that of wig cases. 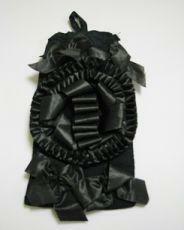 The box also contains a cap and a black rosette. Initial research shows that the cap is a pileus quadratus, also known as cornered cap, black cap or sentencing cap. By 1635 the cap was a standard part of an English judge's attire but as fashion changed and wigs became popular, it was displaced. Judges eventually carried the cap in their hand and after a while it was worn only on ceremonial occasions. In the 19th century it was known as the sentencing cap as judges put it on when condemning prisoners to death. The tricorne and the black cap seem to have been used more or less in the same context at different times, depending on the fashion of the day. The tricorne was often seen as part of ceremonial dress. Presumably it was easier to wear on top of a wig. The wig was not an issue in Canada but it is likely that Canadian judges followed English trends as far as the rest of legal attire goes. The painting of Chief Justice Wilson (1879) in the Osgoode Hall Rotunda shows a tricorne on the chair beside him. The rosette is trickier: Our courts don't allow photographs, people don't usually get photographed from the back, and if they do, those are not the photos that are kept. Queen's Counsel in Britain and a number of other countries of the Commonwealth wear a black rosette at the back of the neck of their robe on ceremonial occasions. This rosette apparently goes back to the days when the full-bottomed wigs, worn on these special occasions, were styled with oil and powder. It is believed that the rosette was meant to catch the oil and powder falling from the wig, preventing them from soiling the robe. Ede and Ravenscroft, thought to be the oldest firm of tailors in the world and a leading provider of legal attire, still lists black rosettes in its offerings for Queen's Counsel. The last item in this gift is a leather top hat box. 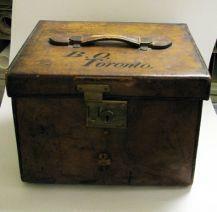 The box belonged to the donor's father, Britton Osler. It was purchased at the Army & Navy Cooperative Society in England, an early cooperative department store founded in 1871. An inscription on a big "Cunard" stamp on the side of the box tells us that the box travelled on the Lusitania, towards New York, leaving its departure point on Feb. 26 of an indeterminate year. The RMS Lusitania is of historical interest because its sinking by a German torpedo in 1915 was the second greatest civilian ship disaster after the Titanic. Some consider this event to be the catalyst for the United States entering the First World War. The Lusitania started service for the Cunard Line in 1907 so we know that the trip was taken during a small eight-year window. The Ellis Island Foundation has scanned manifests of all the ships that entered the port of New York between 1892 and 1924. From these records, we learn that Britton Osler travelled from Liverpool, arriving in New York on March 5, 1910, on his way to his residence in Toronto. He was 36 year old, a barrister, and married at the time. He was 5'9", with a dark complexion and dark hair. His declaration reveals that he had been in New York earlier that year, that he was carrying at least $50 and that he had purchased his ticket himself. He claimed to be sound of body and mind and reassured the authorities that he was neither a polygamist nor an anarchist. This object may be called a hat box, but it is also a key to history.